Is your dog breathing heavy — or are you unsure if his breathing is normal? Are all dog breathing problems a reason to visit the vet ASAP? And what dogs are most at risk for breathing issues? Let’s look at some common questions and concerns about dog breathing here. When are dog breathing problems emergencies? Are all dog breathing problems emergencies? Photography ©fotoedu | Thinkstock. If you notice your dog’s breathing has changed, you might wonder what it could mean or even if it’s an emergency. Certainly, any time you think your dog is having trouble breathing — struggling to breathe, difficulty taking a breath, not getting enough air — do not wait. Take him immediately to the closest veterinary clinic or emergency hospital if it’s outside normal business hours. You don’t want to waste any time in scenarios like this. Why would a dog breathe heavily? What does normal dog breathing look like? To help you determine what dog breathing problems could mean, and whether your dog’s breathing problems require urgent attention, it helps to understand what normal dog breathing patterns look like. A dog who is breathing normally might breathe from his nose with his mouth closed or breathe through his mouth (panting). Most dogs breathe from their nose with their mouth closed when they are at rest or exerting little energy (for instance, when walking around the house). Panting is common when dogs are exercising, excited, stressed or warm. If your dog is chasing a ball around the backyard or running at the park, you would expect to see him panting. On the flip side, if your dog is lying on the couch on a cool day and is panting or breathing heavily, it could be a sign that something is wrong. Additionally, if your dog is panting or breathing heavy and is also acting sick or agitated, it’s a clue that something is not right. What dogs are at risk for breathing problems? Pugs are at risk for breathing problems. Photography ©fongleon356 | iStock / Getty Images Plus. To further complicate matters, some dogs with pushed-in faces (brachycephalic breeds like Boxers, Bulldogs, Pugs and Shih Tzus) have some difficulty breathing in general, due to their face’s flat structure. Narrow passageways make it hard for these dogs to breathe. If you ever suspect breathing difficulties in brachycephalic dogs, it’s an extreme emergency. 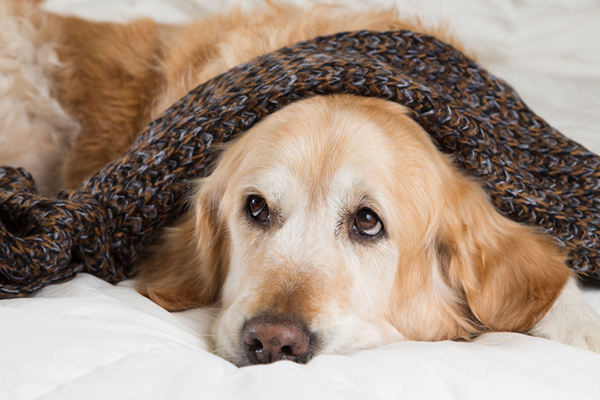 So, what causes dog breathing problems? Many different things may cause dog breathing problems. “Labored breathing may be caused by both upper airway and lower airway respiratory disease, cardiac (heart) disease, pleural space disease (the cavity between the lungs and body wall), and pulmonary parenchymal disease affecting the lung,” Dr. Altmeier explains. This is why it’s important to get your dog checked out by a veterinarian any time you suspect he is panting excessively or having trouble breathing in any way. How are dog breathing problems diagnosed? “Veterinarians are trained to rapidly evaluate the patient, provide emergent medical therapy and recommend diagnostics as needed to further assess the situation,” Dr. Altmeier says. The vet will evaluate your dog’s breathing pattern, listen to his chest and look at the color of his mucous membranes (gums). Pale, blueish- or purple-looking gums are a sign that your dog is not getting enough oxygen. How are dog breathing problems treated? “We will provide oxygen, injectable or inhalant medications, and sometimes minimally invasive procedures such as thoracocentesis, where a needle is placed in the thoracic cavity to drain fluid or air,” Dr. Altmeier says. Your vet might also recommend x-rays or ultrasound of the chest as well as special testing to evaluate lung function. Heavy breathing, labored breathing or excessive panting is not something you want to ignore or blow off. Without enough oxygen, your dog could die. Thumbnail: Photography © primeimages | iStock / Getty Images Plus. The post Let’s Discuss Dog Breathing Problems appeared first on Dogster.